Even before 2015, when Condé Nast changed his title from chairman to chairman emeritus, Mr. Newhouse had stepped away from daily operations at his company. His last major decision was to relocate Condé Nast from its headquarters in Midtown Manhattan to 23 floors at One World Trade, a move that was completed in 2014. “His death is very sad and reminds us all about the heritage and the values and what we stand for,” said Jonathan Newhouse, a cousin of S.I. Newhouse and the executive in charge of Condé Nast’s international titles. In the immediate wake of his death, it appeared unlikely that much would change at Condé Nast. Several executives and editors interviewed on Sunday said that, because Mr. Newhouse had not been involved in the business for more than four years, there was no immediate power vacuum. Steven O. Newhouse, the chairman of the digital arm of Condé Nast’s parent company, Advance Publications, said Mr. Newhouse’s death would have “no real impact” on the magazine publisher. “Si has been sick for quite a while, and a long enough time so that we’ve all gotten past the point of operating with him,” said Steven Newhouse, 60, a nephew of the late chairman. The family, he said, had not considered selling the company and had no plans to do so. Jonathan Newhouse, 65, who runs Condé Nast’s international titles and is a cousin of the late chairman, was similarly adamant that the company would continue to operate as it had for the last several years. Still, the magazine industry faces relentless headwinds, and Condé Nast will now have to carve a path forward without the benefit of Mr. Newhouse in the role of company figurehead. Condé Nast is privately held, and its leadership structure is murky, even to those among its ranks. Major decisions pass through a four-person board made up of Steven and Jonathan Newhouse; Thomas Summer, the chief financial officer of Advance Publications; and Robert A. Sauerberg Jr., Condé Nast’s chief executive. Mr. Sauerberg runs the day-to-day operations of Condé Nast and reports to the board. There is some speculation that a committee of three family members — Steven, Jonathan and Mr. Newhouse Jr.’s brother, Donald Newhouse, who runs the newspaper division of Advance — will emerge to fill the void, though it is not clear if any one person will step forward as the company’s public face. Rumors have also swirled within Condé Nast that Jonathan Newhouse will take over the magazine business. Though he lives in London, he visits New York regularly and has long kept an apartment in the city. For his part, Jonathan Newhouse said his role at Condé Nast was “not affected” by Si Newhouse’s death. “It’s just not a factor,” he said. 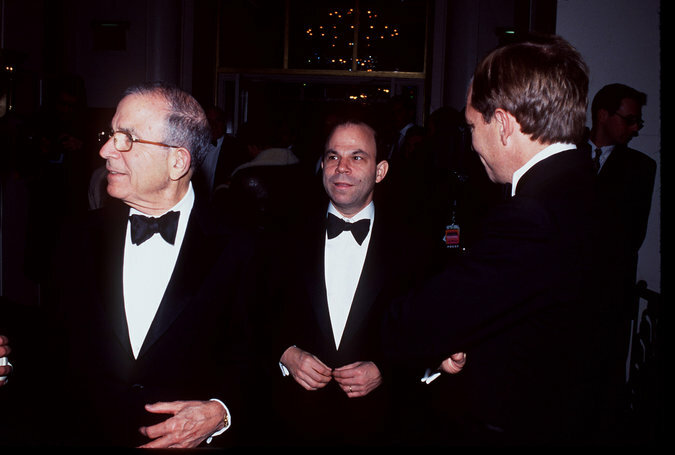 Donald Newhouse, left, and his son, Steven, middle, 2002. Without a powerful visionary at its helm, Condé Nast could be rudderless, particularly if there are disagreements within the family. Typically, family-owned businesses do not last longer than a few generations. The Newhouses got into the magazine business in 1959, when Samuel I. Newhouse Sr. bought the company, largely because of the fondness of his wife, Mitzi, for Vogue. There are other signs that the coming years at Condé Nast will not be easy to navigate. Once a magazine powerhouse whose editors zipped around Manhattan in the back seats of luxury Town Cars, Condé Nast has stumbled along with the rest of the magazine industry. It has shuttered titles and changed production schedules. A sweeping reorganization of its sales team has heightened the angst inside the building and done the business no favors — the company is expected to bring in $100 million less in revenue this year than it did in 2016, according to a person briefed on the company’s financial outlook. The specter of layoffs looms large. Two longtime top editors, Mr. Carter and Cindi Leive of Glamour, said last month that they were stepping down. The Newhouse’s newspaper business, which was named for The Staten Island Advance, includes The Times-Picayune in New Orleans, The Oregonian and The Star-Ledger in New Jersey, is also struggling, long starved of resources even as the magazine business enjoyed lavish expense accounts. In a carefully worded letter to employees on Sunday that was signed (in alphabetical order) by Donald, Jonathan and Steven Newhouse, the family stressed its commitment to the company that was expanded during the Si era. While the ultimate absence of the patriarch may not immediately affect Condé Nast, his death nevertheless seems a fitting coda for a once-gilded magazine industry now in turmoil.